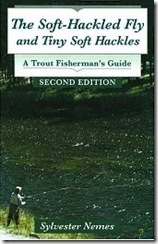 I’m sure most of you have seen reference to the passing of Sylvester Nemes earlier this week, author of The Soft-Hackled Fly and The Soft-Hackled Fly: A Trout Fisherman’s Guide. I attribute much more to the man than most, as he appeared at exactly the right time and rescued fly fishing from a fate worse than death. We were headed down the Dark Path, it was the ascension of Swisher & Richards, Caucci & Natasi, and the dawn of man-made synthetics. Fly fishing had jumped its historic banks and was destined to evolve into leg counting, the correct number of feelers, and making waxy-stiff imitations that were anatomically correct, but hamstrung the artist and lent imitations as much comely as an inflatable love doll. Legitimacy was to say something in Latin rather than English, and authors insisted we cast out the false prophets like Ted Williams, Joe Brooks, and Ray Bergman along with the rest of the baggage. Sylvester Nemes was a much needed counter to all this sudden religious fervor, as the only mystery that Latin couldn’t dismiss was why precise imitation failed to outfish something made of dog hair and owl feathers. … and to lend credence to this odd duck, on his heels came the second British invasion, authors and fishermen like Goddard & Clarke and Frank Sawyer suggesting that a bit of ambiguity could be as powerful as precisely knotted legs or a shiny carapace. I had the good sense to know something horrible was wrong given the porcupine quills needed for “new wave precision” stonefly nymphs kept finding my fingers at regular intervals. Up till now fly tying had never been painful – unless I was showing my flies to others. You won’t see many describing similar attributes to Mr. Nemes, like double-knits, most of us aren’t man enough to admit wearing them. We were caught up in the book burnings and New Entomology, and we didn’t realize how close we’d come to plastic insects and turning our beloved sport into something of complete snobbery. This entry was posted in Conservation, Flytying.